BOB MARLEY & THE WAILERS – B is for Bob – is a new Bob Marley project, but with a BIG hip factor for all Marley fans including kids! Bob’s son Ziggy took a few contemporary spins with classic tracks here and ALL Marley believers should investigate – cross-format appeal…! 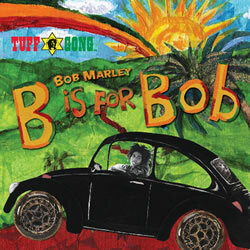 B is for Bob, a collection of Bob Marley‘s most beloved songs re-imagined for fans of all ages, will be released June 23 by UMe/Island/Tuff Gong. The international musical legend’s eldest son, four-time Grammy winner Ziggy Marley, executive produced the album, which bridges the gap between the timeless Bob Marley and a new generation of kids. Released in time for summer, the album features fun extras for kids and parents: the CD unlocks bonus online digital content including coloring book pages and a sing-a-long music video. Each CD also includes a free one-year subscription to Parents magazine. B is for Bob comes in a recyclable and biodegradable Eco-Pak, making the album kid-, parent- and Earth-friendly. This year also marks the 50th anniversary of Island Records, which is celebrating the label’s rich history of music from the luminaries Bob Marley, U2, Traffic, The Cranberries, Cat Stevens, Melissa Etheridge, PJ Harvey, Fall Out Boy more. The Island 50th campaign will feature CD reissues, digital compilations, movie festivals and more.